SupportSupport UpdatesPolar LoopDo you have your physical settings up to date? Did you know that the physical settings you were asked to set to your Polar when you took it to use actually affect all the data you receive from your training device? For example, if you haven’t set your weight correctly to your account, you might actually be burning more calories than the set weight indicates or the other way around! Nobody wants to miss those burnt calories, right? To get the most accurate and personal training data, it’s important that you’re honest and as accurate as possible with your physical settings such as your weight, height, training background and maximum heart rate. They have an effect on calorie calculation, your training load as well as other Polar Smart Coaching features. Or maybe that Training Load might be too high for simply easy training session? That might be because your physical settings are not matching your actual fitness. How about that height? It not only has an impact one the step calculation on any Polar tracker but it also plays a big role on the new wrist cadence feature on your Polar V800. Do you know your max heart rate value? Make sure to update it to the settings since it has an effect on the Zone limits which then again have an impact on the Training Benefit you get out of your workouts. If you’re not sure what is your max heart rate value, you can have it tested in a laboratory test or alternatively calculate an estimation from your age (220- age). The Polar Fitness Test takes into account all the physical values you have entered to the system to be able give the most accurate estimation of your current fitness state. Not gaining any meters during your paddles with your V800? Check that you have set which hand you wear your V800 from the product settings in Flow. If this is set incorrectly the data gathered from your swim might be flawed. Have your training habits changed after you purchased your Polar? Maybe you could check if your training background needs a check-up. The Training background document will help you choose the right level to suit your current status. Take a minute and have a quick glance at your physical settings in Flow to make sure they’re up to date and match your personal data! 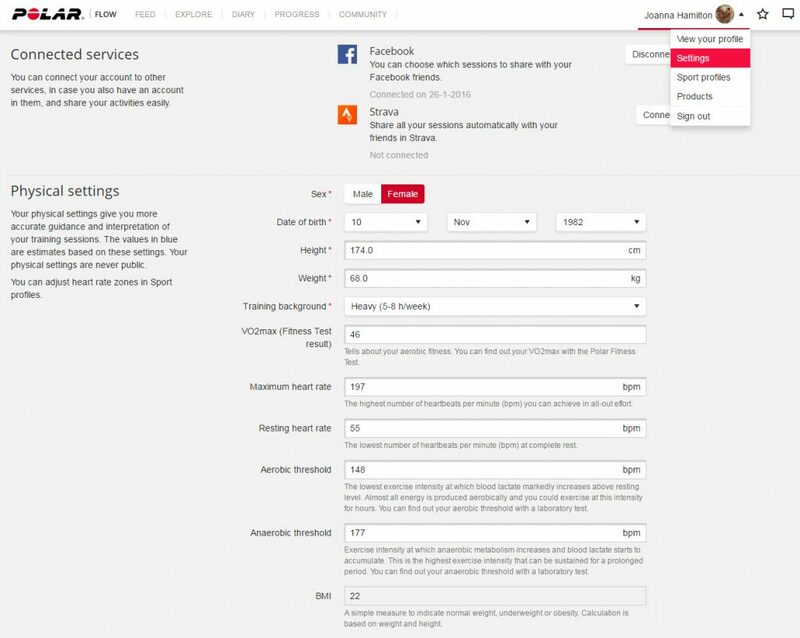 Click your user name in Flow and choose Settings to find all your personal and physical settings. Next time you sync, the settings are synced to your device. If you’re only using the Flow app, you can find your personal settings behind the “more” tab and check the settings behind your name. Polar GlobalSupportDo you have your physical settings up to date?